Discover one of the largest and most renowned museums in the country. 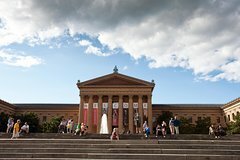 Located on the Benjamin Franklin Parkway in the city’s most iconic building, and the backdrop to the “Rocky Steps”, is home to works by world-renowned artists such as Monet, van Gogh, Rodin, Picasso, Duchamp and Rubens. See historical marvels including a reconstructed Japanese teahouse, a Parisian grand salon, and a breathtaking collection of medieval armor. It is the pride of Philadelphia—enriching our visitors, exciting the community, amazing the world. Discover works of art at one of the largest and most renowned museums in the country. You will find beauty, enchantment, and the unexpected among artistic and architectural achievements from the United States, Asia, Europe, and Latin America at the Philadelphia Museum of Art. A landmark building. A place that welcomes everyone. The arts will come to life, inspiring you—through scholarly study and creative play—to discover the spirit of imagination that lies in everyone. Your visit will connect you with the arts in rich and varied ways, making your experience at the Museum surprising, lively, and memorable. Come see the world—and yourself—anew through the beauty and expressive power of art. Explore the Impressionist galleries—home to Van Gogh’s Sunflowers and Monet’s Japanese Footbridge and the Water Lily Pool, and meander through the Modern and Contemporary galleries to discover Picasso’s masterpiece, Three Musicians. Experience a ‘Walk through time’ of unique architectural treasures, from a medieval cloister to a Japanese teahouse, and a Chinese palace hall to a sixteenth-century Indian temple hall. Just down the parkway, the Rodin Museum offers a tranquil oasis and one of the world's greatest places to experience the work of celebrated French sculptor Auguste Rodin. The Museum is also a major eating and shopping destination, with four shops featuring art-inspired and one-of-a-kind items, as well as books, prints, jewelry, clothing, crafts and toys, plus cafes and a fine-dining restaurant.